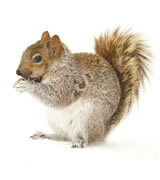 If rodents are able to get into your home, they pose a threat to many areas of your home. They may be small, and even cute in some cases, but rodents are capable of damaging your attic, electrical systems, and even the siding on your home. They are able to scratch and chew through wood, wiring, and piping with relative ease. Many rodents are also carriers of diseases that are dangerous to humans, such as rabies. For being so small, rodents pose a big threat to the safety of your home and family. There are things you can do as a homeowner to make your home more rodent-proof. Food is a magnet for all sorts of pests and nuisance animals, so keeping as much as possible in reseal-able containers is a great idea. Making sure garbage is taken out promptly, and removed from your home in a timely manner is also important, as rats and other rodents turn that into a buffet. Making sure holes in walls are patched up, and removing any possible nesting materials from around your home can go a long way in preventing rodent problems. If you can’t seem to get rid of them though, calling a professional is recommended. If you suspect that there are rodents rooting around in or around your home, give us a call at 813.948.0870 to set up a plan that works for you.